Do you wake up with aches and pains after a restless night’s sleep? It may be that your bed isn’t giving you the proper support you require. For anyone that suffers from back and neck pain the promise of a supportive and comfortable bed at night can bring welcome relief. Eight out of ten people suffer from back problems at some time in their lives and many now choose to buy an orthopaedic bed for this very reason. Designed to softly surround the body to ensure that aches and pains are reduced, back supporting beds can help reduce pressure point build-up experienced when sleeping. Of course, not all people choose an orthopaedic bed because of back pain. Many chose this type of bed because it offers them the firm support they like and prefer. Choosing which type of bed is right for you is not a decision to take lightly. It’s recommended that you spend some time trying out a variety of different beds before you buy. Given that we spend a third of our lives sleeping, this time investment will be well worth your while. A bigger bed will be of benefit both for the back pain sufferer and for their partner. Zip and link beds are a good option if firmness preferences differ widely or where a future requirement for two separate beds is identified. 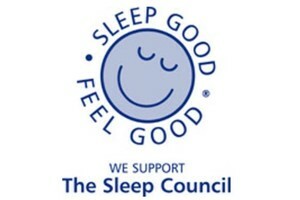 The choice of good quality, orthopaedic beds is such that you’ll be enjoying a great night’s sleep every night. Open Coil springs are the most commonly used spring system on the market today and ideal if you are looking an inexpensive bed with firmer orthopaedic support. A higher quality product, pocket spring orthopaedic beds are individually pocketed springs encased in fabric casing allowing them to function independently of one another. Responding to how your body moves while you sleep, Kaymed produce great tried and tested pocket sprung orthopaedic beds. The Kaymed Ortho Prestige 5' Divan Bed incorporates a deep layer of high density visco elastic with 1600 luxury pocket springs promoting a firmer feel bed with noticeable back support. The King Koil Posture Delight 5' Divan Bed is one of King Koil's International Chiropractor Association Approved (ICA) orthopaedic beds. This luxurious Soft Feel model incorporates 1400 Individually Pocketed Springs for total body support with a Tri-ChiroTM System for Targeted Back Support. Featuring ChiroSpansTM which runs from Edge to Edge in the Critical Third Area, this luxury bed has a Posture Pad TM Zonal Layer which supports the spine in a healthy alignment and Tuff EdgeTM Supports to help keep the mattress edge shape. Many manufacturers now make hybrid beds that use memory foam and/or latex with the traditional innerspring. An increasingly popular choice, these beds can offer the firmness you require, with cushion comforting softness to prevent pressure point build-up. The Spring Air by Briody SleepSense Gel Visco 5' Divan Bed combines COMFORT LOK Coil, which provides additional innerspring support for the lumbar area, Gel Infused Visco foam Upholstery and a luxurious multi-quilted finish to provide the ultimate back supporting springs. King size orthopaedic beds are designed for those that require additional back support and more room from their bed. To truly appreciate the quality and craftmanship of our superb range of orthopaedic divan beds we would encourage you to come and view them at our showroom in Markethill. What's more, at Dalzell's, when we deliver your newoOrthopaedic 5' bed we'll provide you with Free Pillows, Free Delivery and Free Recycling throughout Northern Ireland, and Counties Dublin, Louth and Monaghan. For added convenience we’ll Remove & Dispose of all the Packaging and set up your new divan bed and mattress in a room of your choice. With additional discounts for Multibuy, and our Price Promise call, email or visit in-store today.